with Kurdish	army commander Wageah Barzani. 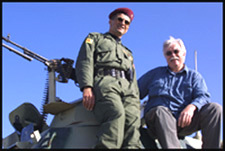 Santa Barbara-based war correspondent Kevin McKiernan is headed back to northern Iraq on Tuesday to conduct interviews and shoot footage for a documentary on the threat of chemical and biological warfare posed by Iraqi strongman Saddam Hussein. This is a story Mr. McKiernan has explored before. He made a treacherous trip to the region in March, crossing the narrow Tigris River from Syria into Iraq, within sight of Saddam Hussein's troops and tanks. A few weeks after he returned home to Santa Barbara, he learned that his five bodyguards were murdered by Islamic extremists during anambush on Kurdish prime minister Barham Salih. Mr. McKiernan has documented violence and unrest all over the world-from Nicaragua to Turkey. But he doesn't seem to be hardened by it. The walls in his crowded office at the Granada Building are covered with poignant photographs of people he interviewed during war. He is drawn to people who would be considered underdogs. The Iraqi Kurds certainly fall into that category. He refers to them as the largest group of ethnic people in the world without a homeland. When Mr. McKiernan comes across the pictures he took of the Kurdish bodyguards who befriended and protected him in Iraq, he has to pause for a moment. He'll visit their families, and bring them these photographs, he says. 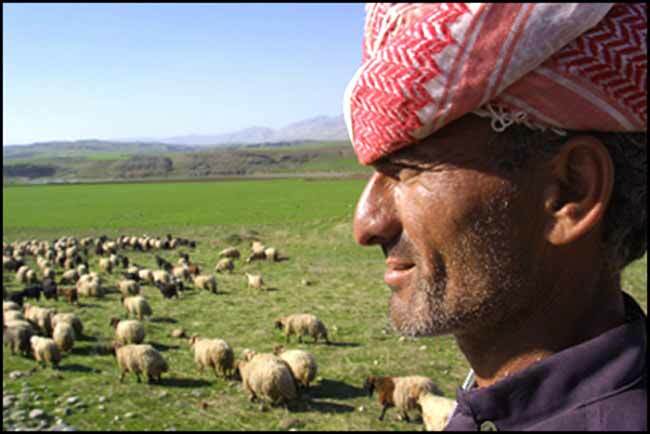 A Kurdish shepherd tends his flock in northern Iraq near the Turkish border. 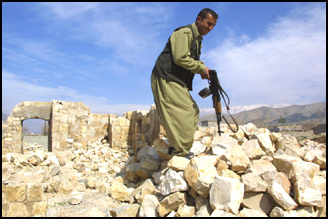 One of Kevin McKiernan's bodyguards climbs over debris in Halabja, where more than 5,000 Kurds died in a 1988 chemical attack by Saddam Hussein's forces. States if it attempts to overthrow the Iraqi dictator. The Bush Administration has said it wants Kurdish forces to participate, just as Northern Alliance forces did in Afghanistan. Some Kurdish people are wary of such a plan for many reasons, according to Kurds interviewed by Mr. McKiernan, who has made more than a dozen trips to the region since 1991. He's written extensively about the Kurds for Time and Newsweek magazines, and the The New York Times and the LA Times, and has produced live reports for the networks. He also made an award-winning documentary for PBS called "Good Kurds, Bad Kurds" which outlines inconsistencies in U.S. foreign policy and the disastrous effect. "The Kurds are looking at this proposal through lens of betrayal," he said. The Kurds rose up against Baghdad at the request of the United States-expecting they would get U.S. support-in 1975 and again in 1991, only to find it not there in the end. In both cases, Mr. Hussein retaliated, killing thousands of Kurds and driving even more into the hills. In 1991, according to some reports, more than 2,000	Kurds died every day of dehydration, typhoid, and dysentery. "In 1991, President Bush Sr. exhorted them to rise up, and in the end they felt they were sandbagged and betrayed," said Mr. McKiernan. "There is this history of U.S. abandonment. The people say they have done the bidding	for the U.S. in the past, only to turn around and find a knife in their backs." At that time, there were fears in the Bush administration of entangling ground troops in a long-term war if the decision was made to topple the regime. Also, there were concerns that further U.S. involvement would fragment Iraq, causing destabilization in the region. There were worries about interrupting the flow	of oil, and President Bush was facing an election the following year. Mr. McKiernan first went to Northern Iraq during the Gulf War and was shocked by what he found. Most news organizations	weren't very interested in the plight of the Iraqi Kurds, and many Americans had never heard of them. "Back then, 1991, there were these terrible scenes of devastation," he said. "You saw the people living in tents in the mountains, children buried every	day, a lot of sickness and death." Between 1975 and 1990, Mr. Hussein embarked on a depopulation campaign in Kurdistan, destroying more than 4,000 villages, according to most estimates. 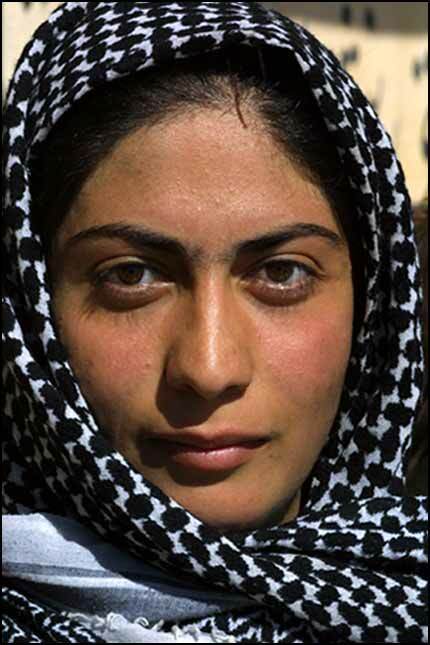 Women are among the fighters at a Kurdish army base. "There are a few BMWs and Mercedes, some Internet cafes, and satellite cell phones allowing people to call anywhere in the world. You see women in (veils) walking alongside teenagers putting on mascara." In 1988, Iraqi warplanes dropped capsules of deadly cyanide gas on Halabja, one of the largest cities in Kurdistan, killing more than 5,000 people,according to a U.S. Senate report. Thousands more suffered from blindness, burnt skin, miscarriages and birth defects. Iraqi Kurds refer to this attack as their Holocaust. "Part of my assignment this last time was to go to Halabja," said Mr. McKiernan, whose upcoming documentary "Avoiding Armageddon," is for Turner Broadcasting. "This event is seared into the collective memory of the Kurds and it remains what they are most afraid of. There is this fear that if there is an attack on Saddam, the U.S. forces will be there in their chemical weapons suits, and they will be standing there naked." The Kurds are so nervous about chemicals that all Mr. Hussein would have to do to create a panic would be to drop bags of sugar from the sky, Mr. McKiernan said. Thousands of people would immediately flee for the mountains, as the refugees did in 1991. While Kurdish history is filled with war and devastation, life is remarkably improved today, said Mr. McKiernan. Although it is not a state, Kurdistan is now somewhat stable. A United Nations resolution has set up a "safety zone" over the region which bars intrusion by the Iraq army, and daily fly - overs by U.S. and British military forces ensure that it is enforced. An unofficial government is in place and the Kurds trade with their neighbors. An oil refinery has been built and there is ample food, thanks to the oil-for-food program. "You can see now that people have disposable income," said Mr. McKiernan. "There are a few BMWs and Mercedes, some Internet cafes, and satellite cell phones allowing people to call anywhere in the world. You see women in (veils) walking alongside teenagers putting on mascara. There are female judges, and dozens of newspapers, including the one from Saddam's party." For the first time in decades, the Iraqi Kurds are experiencing a fragile liberation, which could come crashing to an end if the United States goes after Saddam Hussein. "These are boom times, they are running their own show, there is money, trade and jobs," he said. "Some say Saddam is in a cage since Sept. 11, so why even go there? But others believe that the only way to preserve what they've got is to go after him now."